OUR PRODUCTS >> DRIVE LINE & HANDLING >> PUMPS & PUMP CONES >> TBM RACING KAWASAKI 800SXR SUPER PUMP CONE "PRO"
TBM RACING KAWASAKI 800SXR SUPER PUMP CONE "PRO"
Introducing the most revolutionary pump component ever released for the Kawasaki stand ups. We have turned our dream into reality by designing a component that transforms the inefficient OEM pump into a high performance race pump. Over two years of development has gone into this design and literally hundreds of prototypes have been tested before we settled on this configuration. We have increased the hub diameter of the OEM pump, which creates an increase in pump pressure keeping the pump "loaded" in rough water conditions. The increased efficiency adds amazing acceleration, improved handling and top speed. 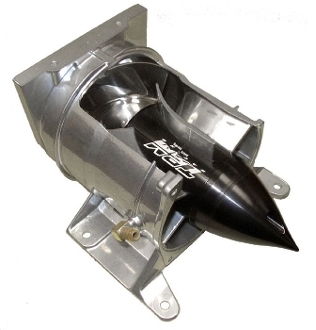 The Super Pump Cone is designed to be used with the OEM, Solas Dynafly, or C-75 Skat-Trak impellers in standard, or a 5mm set back. Installation is as simple as changing an impeller and can be performed with standard tools. Fits '92-Present Kawasaki 750/800 stand ups. *Due to the demands of Pro Racing we have redesigned our Kawasaki Super Pump Cone to increase the strength and offer our riders with the option to "tune" the pump for their particular set up or water conditions. Included with our "Pro" kit is the Super Pump Cone insert, a tail cone base that seals the pump and three different length tail cone tips. The tail cone tips can be changed by simply removing one M6 bolt and replacing the tip with a different length to optimize your impeller and nozzle combination. The short cone works well for Freestyle, Freeride and tight Closed Courses, while the medium and long tail cone works excellent for rough water hook up and amazing top speed. Note: This is an outstanding alternative to purchasing an expensive aftermarket pump and we have seen amazing results in a Limited class application.